To be the first player/team to reach 15 points. Place the “1” answer board in the middle of the table. Each player/team then chooses a color and takes the corresponding answer board and the two meeples of that color. Players also take a dry erase pen, and something to erase their answer board with. One player is chosen to be the scorekeeper. The youngest player takes the cards and chooses the card for the first round of the game. The current player chooses one of the two questions on the card that was drawn and reads the question out loud. All of the players (including the reader) writes a numerical answer on their answer board and places it face down on the table. After every player has written down their answer, everyone flips over their boards. The answer boards are sorted from the smallest number to the largest number. If two answers are the same, place the two answer boards next to one another. The current question is how many countries won at least one medal at the 2008 Summer Olympics. Each player now has to choose which answer they think is closest to the correct answer without going over. Each player has two meeples. The small meeple is worth one point while the large meeple is worth two points. The players can choose whichever answer they want to put their meeples on. The player doesn’t have to put their meeples on their own answer and the player can choose to put both meeples on the same answer or to split them between two different answers. After everyone has placed their meeples it is time to see what answer is closest to the correct answer. The current reader looks at the back of the card and tells everyone the correct answer. The answer board which is closest to the correct answer without going over is the winning answer for the current round. The player(s) that wrote that answer get one point. Players also receive points if they placed one or both of their meeples on the winning answer. The small meeple is worth one point and the large meeple is worth two points. Each player’s score is marked on the score board. Every player has submitted their answer to the summer Olympics question. The answers are sorted numerically and all of the players vote for what they think is the correct answer. The correct answer is 87 so the answer of 85 is the closest. The green player scores one point for the small meeple, two points for the large meeple, and one point for having the closest answer for a total of four points. Yellow earns two points for the large meeple. The pink player earns one point for the small meeple. Everyone takes back their answer board and their two meeples. Players wipe off their boards and a new question is drawn for the next round. The first player/team to reach 15 points wins the game. 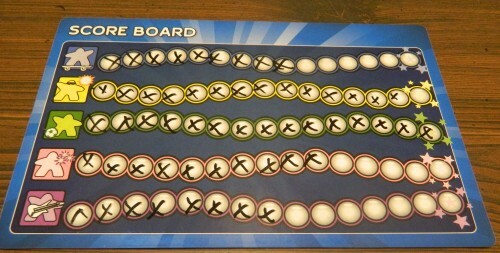 If two players both reach fifteen points in the same round, whichever player scores more total points wins the game. If there is still a tie, the younger player wins the game. The green player has scored fifteen points and has won the game. One of the oldest genres of board games is the trivia game. Every popular topic has its own trivia game made at some point. The problem is that most of these trivia games aren’t very good. The biggest problem with most of these games is that the questions in the game are way too specific for people to know the answers to unless they are experts in the topic. You end up wasting so much time with questions that you have no idea what the answer is. This is the main reason why despite liking trivia I don’t play a lot of trivia games. One of the few exceptions that I have found is the game Wits & Wagers. While we have never reviewed the original Wits & Wagers on Geeky Hobbies before, I have to consider it my favorite or at least one of my favorite trivia games of all time. While it is not as good as the original game, Wits & Wagers Family is still a great trivia game. What I have always liked about Wits & Wagers is that the game is quick and simple. The game is so simple you can teach the game to new players within minutes. All you do is read the question and guess what the correct answer is. Since all of the answers are numeric, it doesn’t matter that no one knows the actual answer to the question. Most of the time players won’t know the exact answer. All you have to do is try to guess as close to the correct answer as you can without going over. This fixes a lot of the problems with other trivia games having too specific of questions. In Wits & Wagers it doesn’t matter if a question is really specific since someone will always be right as long as all of the players don’t go over the correct answer. The most interesting part of Wits & Wagers is the betting phase of the game. You might not know the answers to any of the questions but if you do a good job betting you can still win the game. This keeps everyone invested in the game since a player that isn’t as good at trivia games can stay competitive with a player that is great at trivia games. The bidding mechanic can even add a little strategy to the game since you need to figure out how you want to bet on the answers. You could be pretty sure of the answer and just bid on that answer. You could also bet on ranges. The range mechanic is interesting because you could be close to the correct answer but have a very small range where you will be the winning answer. This means that players need to consider what they think other players will guess so they aren’t stuck in a situation where the only way they can have the right answer is if they were exactly correct. Players may even slightly alter their own answers in order to try and maximize their range. With such simple mechanics, a game of Wits & Wagers can move really quickly. 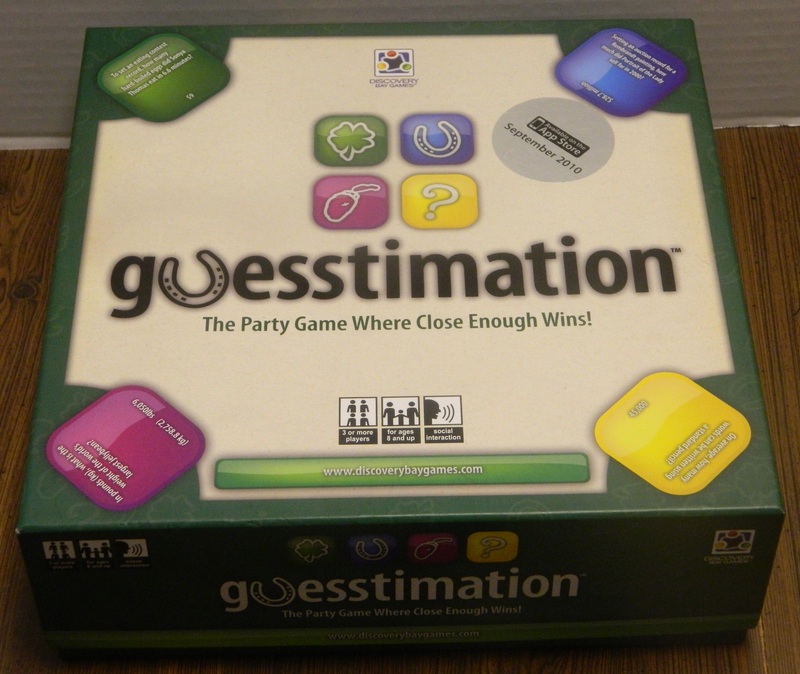 At least in the family version of the game, a player can usually win within 10-15 minutes. This means that you might want to alter the rules to make a game last longer or play several games and determine the winner by who wins the most games. While I really enjoyed Wits & Wagers Family, the biggest problem with game is that it just isn’t as good as the original Wits & Wagers. While the two games are very similar they aren’t exactly the same. Two areas where the games differ is in the type of questions in the game and the scoring system. The biggest difference between the two games is the scoring system. Wits & Wagers Family simplifies the scoring system used in the original Wits & Wagers. In the original game players would place bets (using chips) on the answers which would payoff if they were correct. In Wits & Wagers Family you just use your meeples to bet on one or two different answers. This system is much simpler since you either score points or you don’t while in the original game you have to figure out how much each player is paid. Personally I don’t mind either version of scoring since they both have their own merits. I like the scoring system in the family edition since it is much easier to use and will work better with children. The scoring is also much quicker. The scoring system in the original version of the game is more complicated but leads to more strategy. I have no problem using either scoring system and they can easily be interchanged. 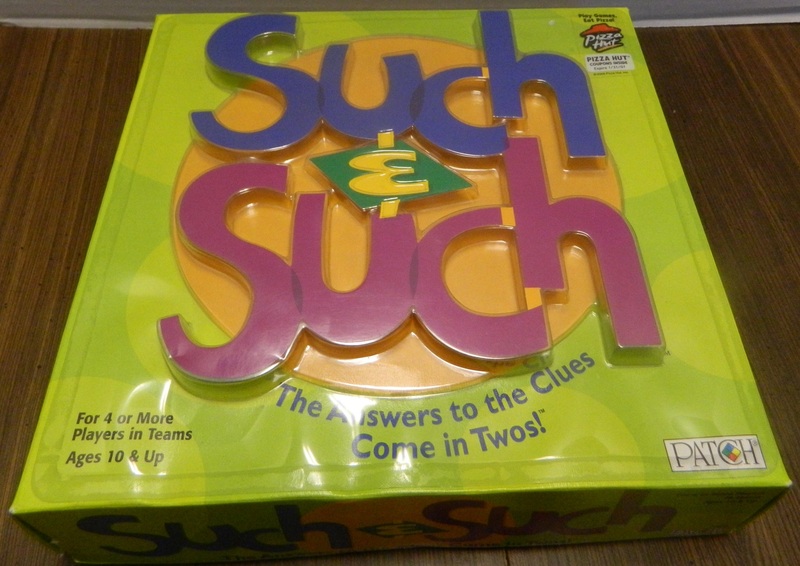 The other big difference between the two games are the type of questions included with the game. Being a family version of the game it is not that surprising that a lot of the questions are gauged more towards children than the questions that came with the original game. The family version has some questions that pertain to children’s shows or other topics that either adults don’t know or care about. A lot of these questions are also kind of time sensitive so they will probably become outdated pretty quickly since kids won’t care about things that were popular back in 2010. The questions in the family version are also considerably easier than the questions from the original game. Players in our game knew the exact answer to the questions several times which kind of takes the fun out of the game. If you are playing the game with children the questions from the family version might be better but for adults the questions in the original version are much better. Speaking of questions, Wits & Wagers Family has the same issue as all of these type of games in that there are just not enough questions in the game. The game comes with 150 cards (300 questions) which you will go through pretty quickly. This means that Wits & Wagers could have some replay issues if you can remember the answers to the questions. The good thing is that you can come up with new questions pretty easily or borrow question cards from other similar games to Wits & Wagers. 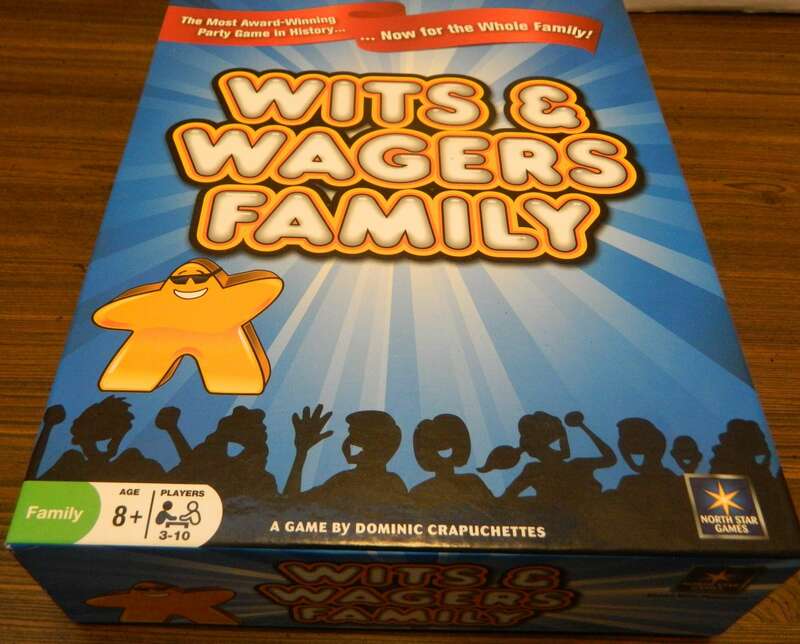 Other than the lack of questions the contents in Wits & Wagers Family are really good. The artwork is really good. I love when games use wooden meeples and the game runs with that theme for all of the artwork in the game. I also like that the game included dry erase boards instead of just using paper for player’s guesses. 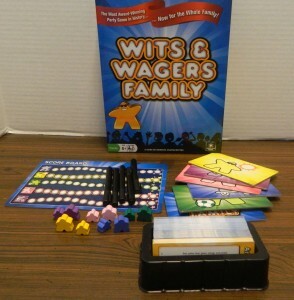 If you are looking for a good trivia game Wits & Wagers/Wits & Wagers Family is a great game. The game is simple but is so well designed that everyone can have fun in the game even if they generally aren’t great at trivia games. Wits & Wagers is possibly the best trivia game I have ever played. Really the only complaint about Wits & Wagers is the fact that there aren’t enough questions in the game and some of the questions in the family edition are not the greatest. If you are playing with younger children I would probably recommend picking up Wits & Wagers Family. If you have older kids though or are only playing with adults I would probably recommend playing the original Wits & Wagers and then maybe switching to the family version once you have run out of questions. While I personally prefer the original game more than the family version, the family version is still really good and uses a much simpler scoring system. If you are looking for a good trivia game and have yet to play Wits & Wagers I highly recommend the game. If you have already played the original Wits & Wagers or have younger children, I would recommend looking into Wits & Wagers Family. A fun twist on the traditional trivia game. Easy to play and accessible for people who aren't trivia buffs. Too many of the questions are gauged towards children and will become outdated quickly. The game has too few questions.